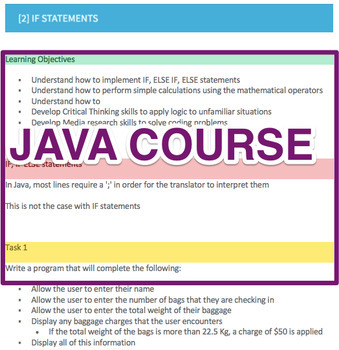 This is my introductory programming course in Java. Teacher guide - just an outline of each of the tasks and my approaches to teaching them. Solution Java Files - completed solutions for all of the activities. There are 14 different activities in here - as well as some paper based activities to trace code etc, that I use. Whilst there are 14 activities, some of them are activities that I spend 2-3 lessons on, as well as the final two activities being mini projects to look at some of the more complex features of OOP. These take from 3- 5 lessons depending on student ability level, as well as having scope for student who are more able to take some responsibility for their own learning and develop their own skills further. Whist these JAVA programs will open in any JAVA IDE, I created them in BlueJ which is a nice, simple interface for introducing Java. Video support will eventually appear on my youtube channel, but is currently not yet complete. Ensure you are able to uncompress zip files, as the teacher guide, solutions, student booklet and starting point files are compressed into a zip file.